In my 46 plus years of clinical practice, I have come to the conclusion that the common denominator for achieving real healing and health is with the use of scalar energy. The Theraphi Plasma System, which is now available in our practice, utilizes 18 specific healing frequencies coupled with a Bio-Active Plasma field of scalar energy to affect cellular regeneration. Scalar energy is a spiraling wave the same as the Fibonacci spiral which is the same as the double-helix shape of DNA. Scalar energy provides the template for healing. In addition, scalar energy disassembles viruses, bacteria, heavy metals, toxic chemicals and other stresses within the body to render them innocuous. The Theraphi Plasma System coupled with our present CyberScan System provides the most comprehensive assessment and body modification approach available today. A treatment session with the Theraphi System takes only 3 to 5 minutes and is totally non-invasive with only positive side effects. An example of Theraphi’s incredible effectiveness was recently witnessed when one of my patients who experienced left knee pain since March 2016 and had total resolution in two days with just two five minutes sessions. He had sought acupuncture, chiropractic and massage therapy during the five month period with no lasting results. 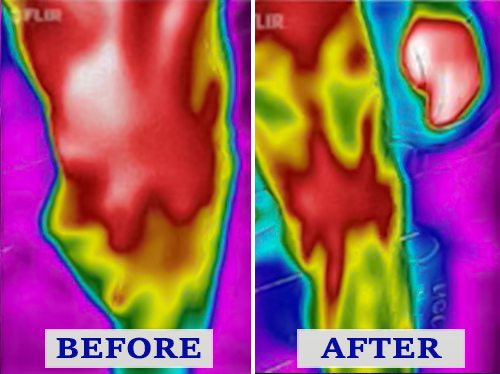 Of interest, a decrease in the inflammatory process was documented by means of infrared photography. A dramatic decrease of 11.54 F drop in temperature occurred immediately following treatment on the second day. The patient was in awe of the results. The Theraphi Plasma System integrates the research of Raymond Royal Rife’s healing frequencies from the 1930’s, Nikola Tesla’s non-invasive scalar wave electrotherapy from the 1920’s, Antoine Priore’s electromagnetic healing technology from the 1960’s and ’70’s, and Georges Lakhovsky, a Russian physicist, who in 1925, while living in France, integrated the research of the three aforementioned pioneers. The ultimate benefit of the plasma generator is that the coherent electromagnetic field created by the Theraphi System restores your body to its original condition. In other words your cells revert back to a factory default setting when every thing was in a state of health. This represents anti-aging at its finest. It becomes an obvious conclusion that if a cell that is in a pathological, abnormal or diseased state can be reversed, then diseases such as MERSA, Alzheimer’s, dementia, heart disease, sports and other types of injuries and other medical illnesses like cancer can also be reversed. In the 1960’s and ’70’s these medical miracles were a reality but then suppressed. The work of Vlail Kaznacheyev, a Russian researcher in the mid-1970’s showed that use of scalar electromagnetic waves can reverse cell death and the disease process. Rife, Priore, Lakhovsky, and Kaznacheyev successfully reversed cancers in animals and Rife in humans.